Introducing my 3-year-old child to his first pet fish – What species did I select? I’ve been entranced with the myriad of stunning Betta types available through online transshippers for a couple years now, a phenomenon of the internet truly globalizing the world and connecting people who’d never otherwise meet. Of course, this personal interest in Bettas stems all the way back to reading about the lost “Tutwiler Butterfly Betta” in the 1986 edition of Axelrod & Vorderwinkler’s Encyclopedia of Tropical Fishes published by TFH Publications (there are many 1998 editions currently available at Amazon too – this title appears to be out of print). 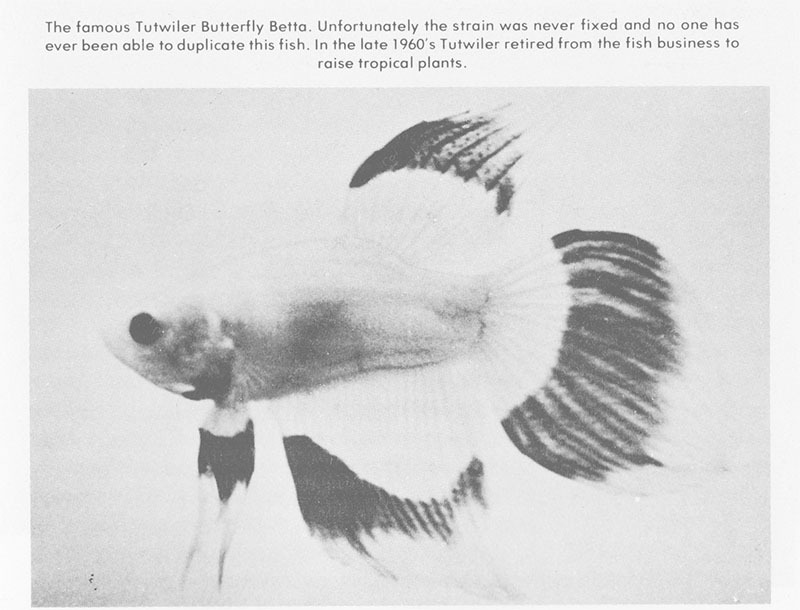 To this day, the Tutwiler Butterfly Betta seems to haunt online forums just as it lurked in my childhood memory, a subject of mystery and speculation. Two main schools of thought seem to emerge, that the Tutwiler fish may have been what we now call a “tri-band” betta, or perhaps better referred to as the modern day “reverse butterfly” betta. Of course, it doesn’t help when a black and white photo like the above doesn’t convey that the fish is actually red and white. Modern breeders seem to have come very close to recreating Tutwiler’s lost fish, but nothing quite like what you see above. Around this same time as I was thinking about my son Ethan’s new pet I became aware of a very curious local fish store in St. Paul, Minnesota, about 2.5 hours south of me, which happened to specialize in one species of fish – Betta splendens. This shop, known online as the MN Betta Shop (aka. “The Betta Shop”, its actual name), had grabbed the attention of fellow saltwater hobbyists in the region (you know there’s something curious going on when saltwater hobbyists are jumping into the freshwater arena and raving about a fish shop). I’ve always found the cost of transshipping a couple bettas from online sellers to be prohibitive (to import a single pair of Thailand bettas might set you back $80 to $100), so I was able to resist the temptation. This local fish shop presented a rather unique alternative to transshipping these high-end fish! Ethan’s fish species was obviously decided for him: we would delve into the classic Betta splendens. Of course, this would be the perfect excuse to engage with a local enterprise like The Betta Shop, and maybe I could hang some fish jars from the rafters in my fishroom? For the sake of the new hobbyist reading this, I’ll simply brush on the fact that a Betta is arguably one of the most forgiving and easy-to-care-for fish out there. They have relatively minimal space requirements and can flourish with proper care in something the size of a mayonnaise jar without any filtration. They are truly perfectly suited as a pet for my 3-year-old son, provided of course I give him plenty of guidance and support. Granted, we have a boy who listens really well and we’ve been told is an “easy” and “bright” child…our new daughter will have her own personality, and she might or might not be ready for a pet even when she’s 5. We’ll certainly make these decisions child by child. Of course, deciding Ethan would have a pet fish also gave me the opportunity to put another tank “upstairs”…and well, his new sister should have bettas in her room too (I figured they would give my wife or me something to look at in one of the 3 AM crying fits or feeding sessions). If you can’t see the wheels of a true aquarium addict turning, let me point out that I’ve now just added two more tanks outside of the fishroom. 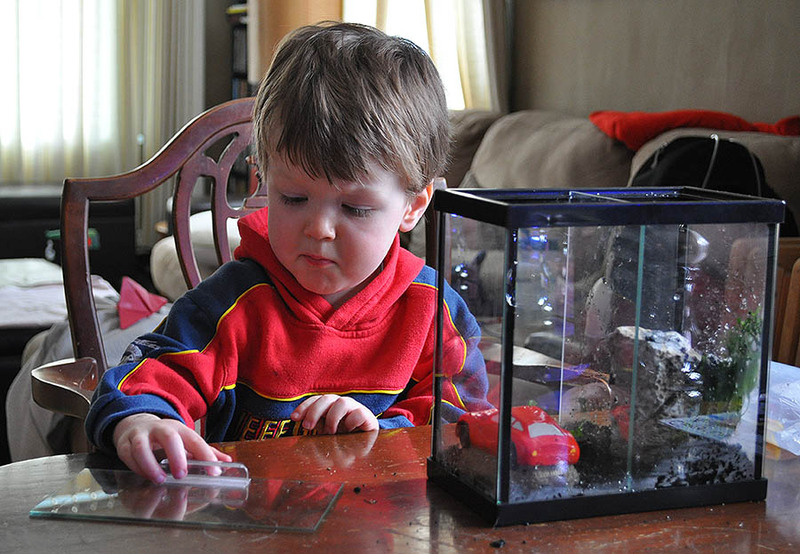 Three year old Ethan checks to see whether his choice of aquarium decoration fits the Deep Blue Betta Tank. Ethan got his 2-compartment betta tank as a random surprise present shortly before his sister’s arrival; picking out a decoration at the local fish shop was an added bonus for his being well behaved during fish deliveries. I refrained from excessively imposing my aesthetic on his tank…yes, I chose the gravel (CaribSea Eco-Complete Black Planted Tank Substrate scooped out of a tank downstairs), and the Windelov Java Fern springs were scavenged from the basement. However, the starkly contrasting natural gray rock, and the completely out-of-place red sports car ornament, were both totally his doing. Ethan was told right up front that he would have a betta fish in this tank. The individual fish would be completely up to him. 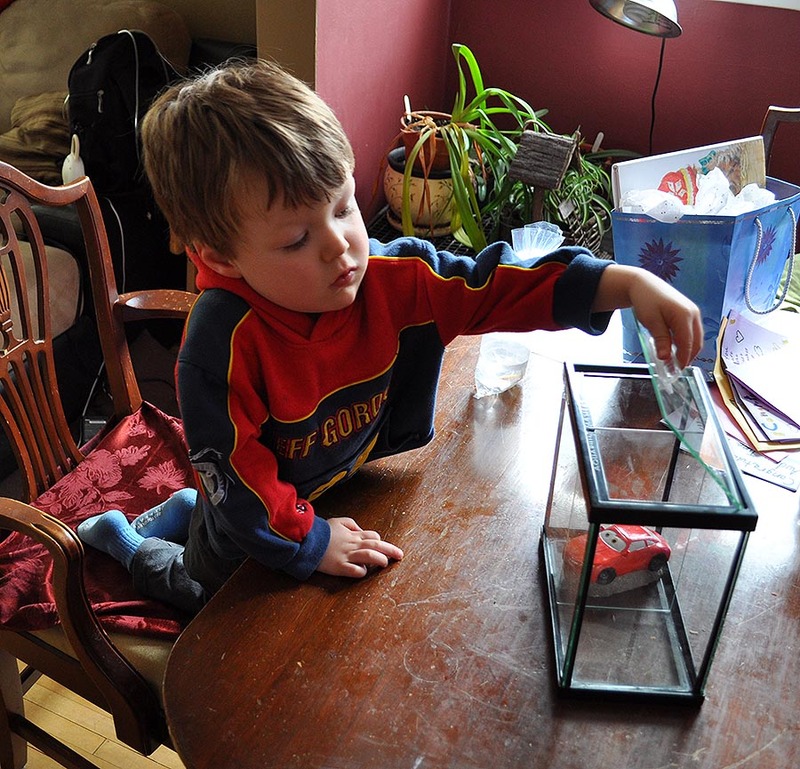 The author’s son Ethan.preparing his first aquarium for his first pet fish. Tutwiler Betta: Photographer unknown, Encyclopedia of Tropical Fishes by Axlerod and Vorderwinkler, 1986, TFH Publishing.